Ever since I made the 'Puff pastry egg tarts' in August last year, it has become the most-read post on my blog. 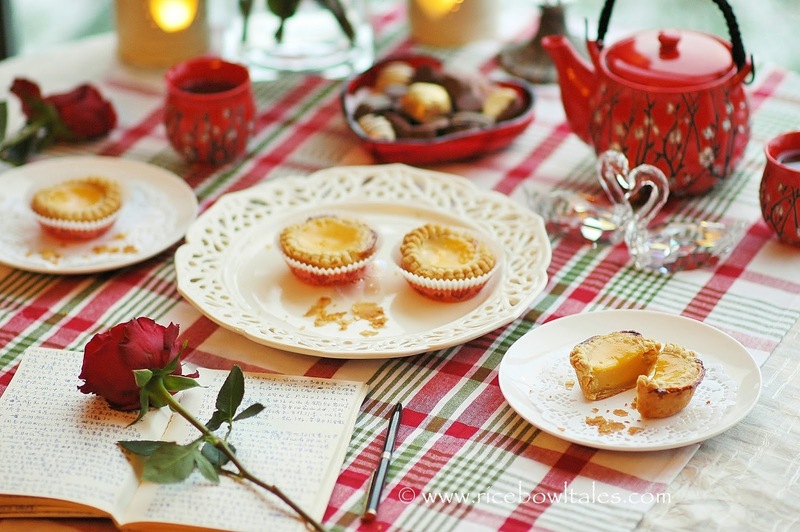 I've since received emails and messages from readers asking me questions concerning different types of flours, oven temperature, folding methods and so on. 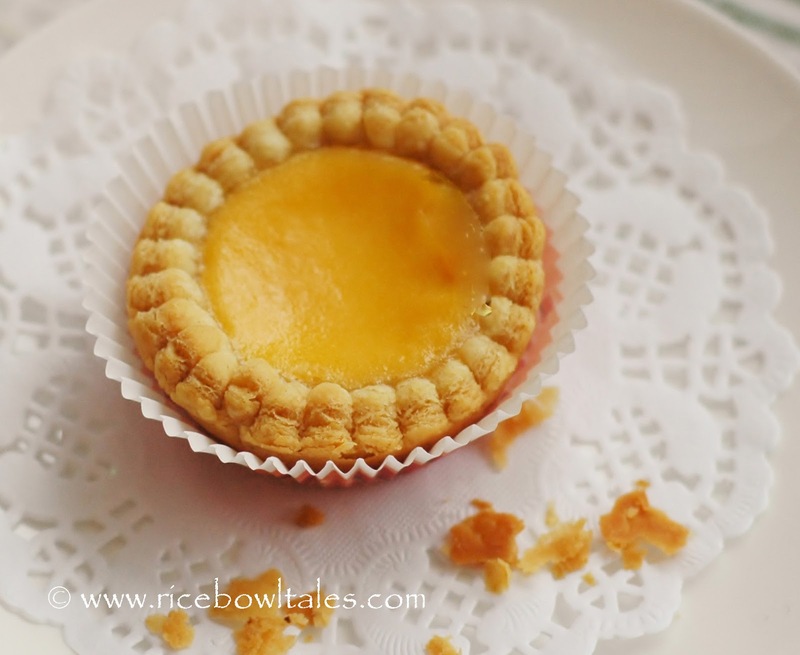 The key to making this puff pastry egg tart successfully of course relies on whether the pastry is baked successfully. 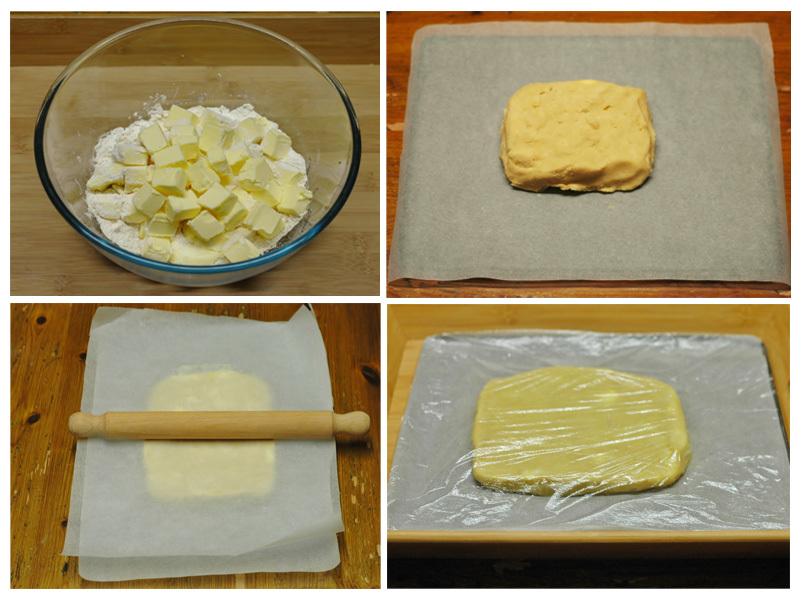 With my last recipe, the oil dough was made using butter and was wrapped inside the water dough like a parcel. I then roll it out together after chilling and fold it up again using the 3 x 3 x 4 book fold method. 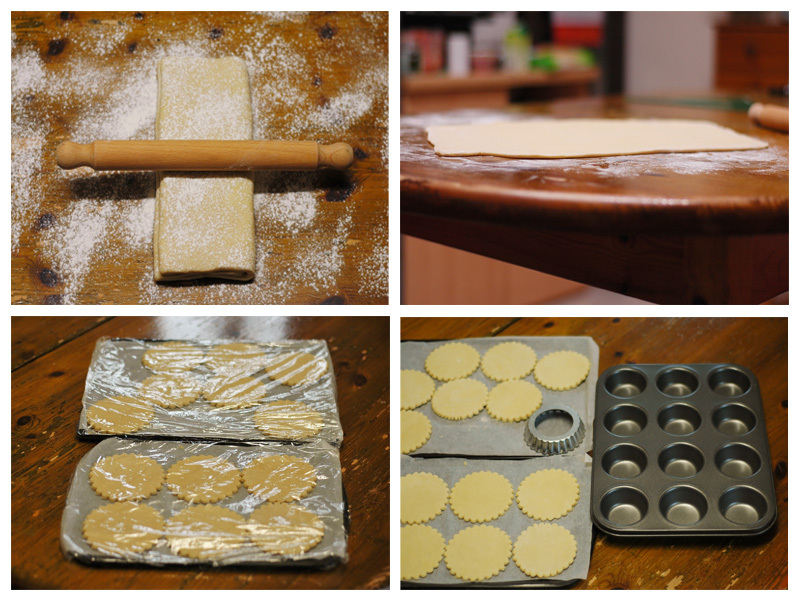 I've practiced that technique quite a few times so it was no problem for me to produce a good puff pastry for the egg tarts. 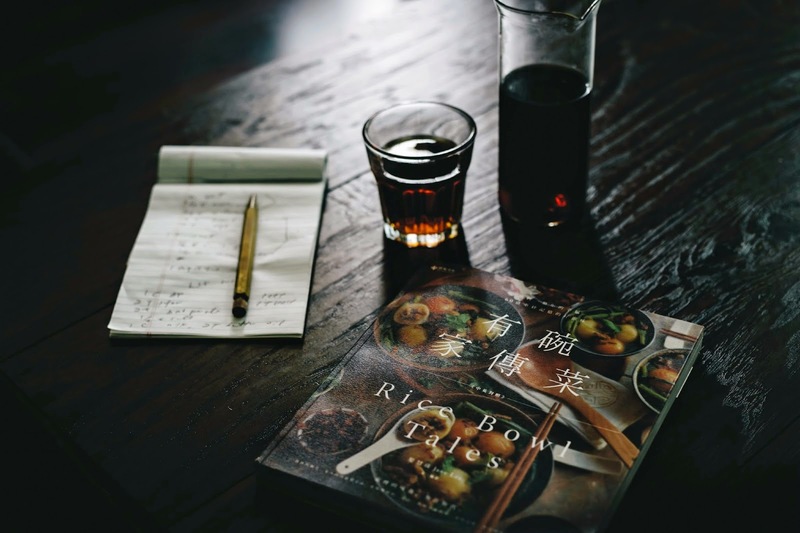 However some of my readers have said that their water dough was quite easily tore open during the rolling process and the butter from the oil dough escaped from inside and squeezed through. When this happens, the dough is considered a failed attempt, and should not be used any further; the finishing result would be some greasy soggy tarts instead of puffy and crunchy ones. 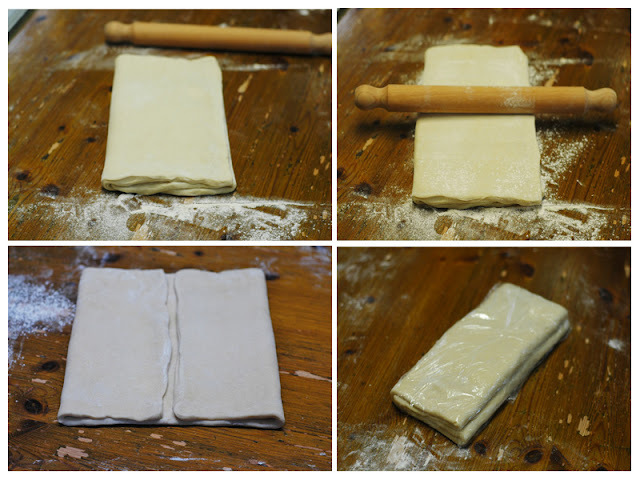 After carrying out a lot of research and testing; I've developed another method of making puff pastry that is easier to do and is more tolerant of the rolling and stretching required to make good puff pastry. 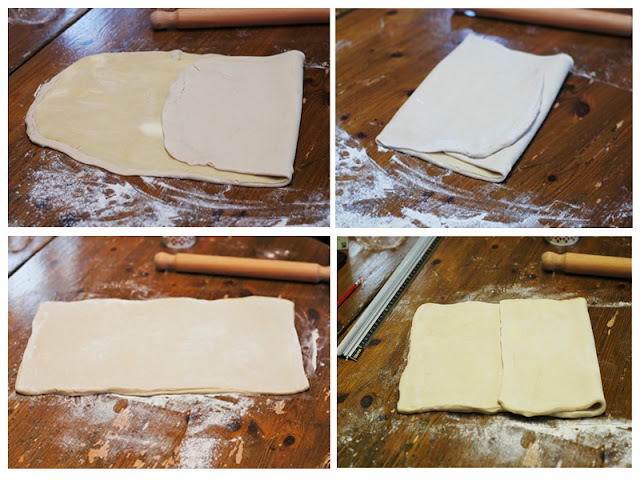 With this method I still avoid using lard and shortening to achieve the crusty and flaky texture in the pastry. I made some for us to have as part of our Chinese New Year celebration food the other day. They looked and tasted great, but I wanted them to look more like the shop bought ones to satisfied my husband's request. So I tried again, using a deep cup-cake tray to bake the egg tarts instead of the shallow, loose-bottomed tart tins I used with all my previous ones. The result was they really looked and tasted like those you bought from the bakery. He smiled, and gave me his nod of approval.This time around, I also learned that if you want to have golden-colour egg custard tarts, you have to use good quality free range eggs. They do make a great deal of difference. You can see for yourselves from my photographs. Make the oil dough first. In a large bowl; incorporate all the ingredients together，then shape and form it into a small rectangular dough, and put it onto the baking tray which has already lined with parchment paper. Place another piece of parchment paper on top of the dough. Press and push until the dough is about 2 cm thick. Cover the whole tray with cling film and put it in the fridge to chill. 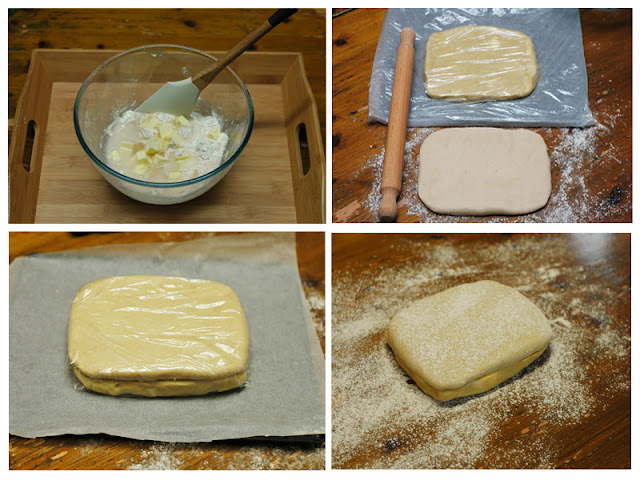 dough, wrap them up with cling film, and leave it in the fridge for 6-7 hours. ( total of 3 turns ). Let dough soften slightly in room temperature for 5-10 minutes, flour on top slightly. up 1/3 then fold it up again, this is the 1st turn ( above top right ). turn. Wrap the pastry up with cling film, put in the fridge and leave it overnight ( 7-8 hours ). baking tray, wrap in cling film, leave in fridge for an hour. cooled, and stir well to become the filling. baking tray, press them down gently, and put them back to the fridge for 1/2 hour before baking. 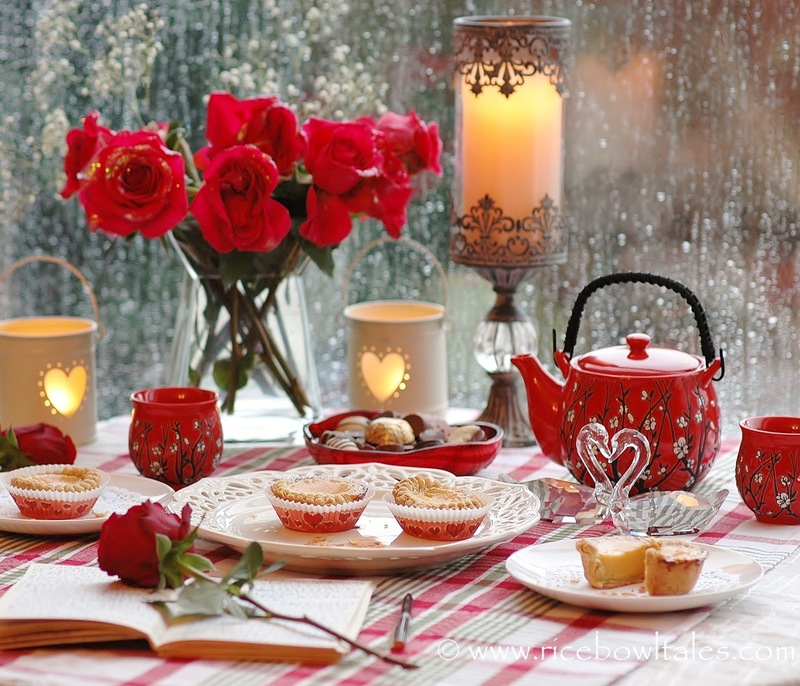 sugar returned back to the surface, so don't reduce the sugar quantity in the ingredients of the filling. 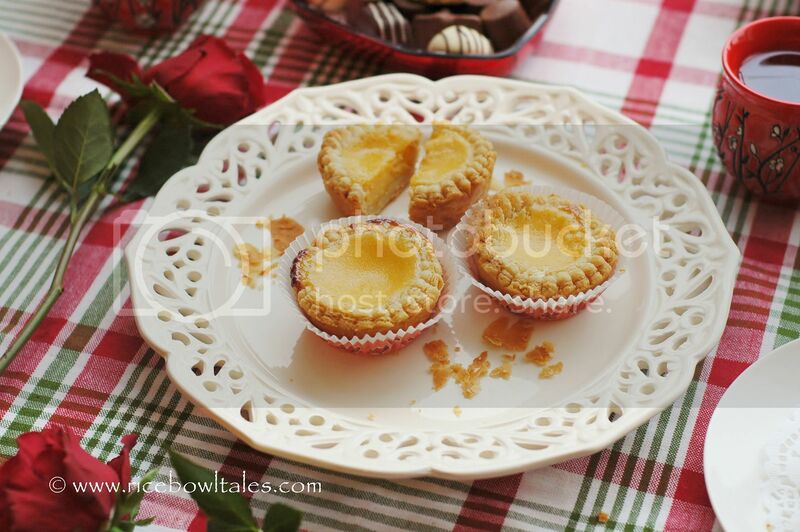 Egg tarts are one of our all-time favourite in Chinese bakery. We never tired of buying and eating them. 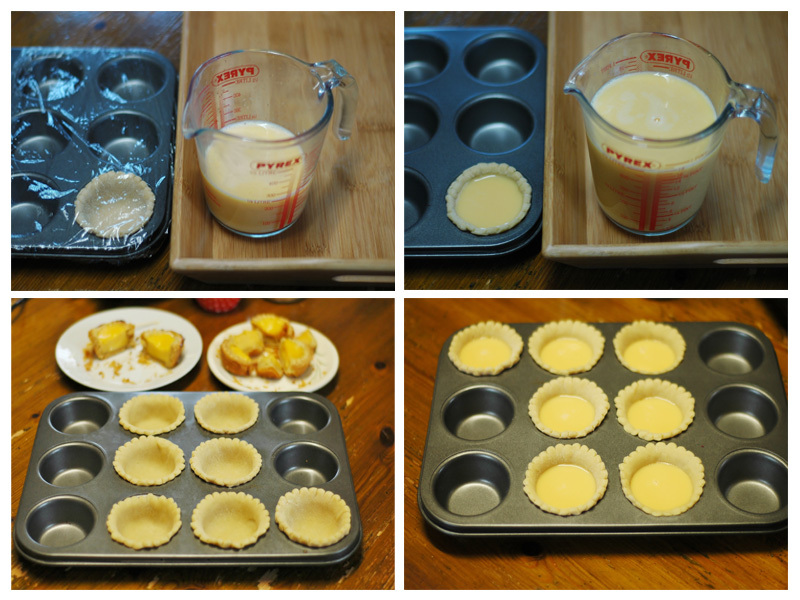 If you follow my instructions step by step and practice, before long, you can bring out tray after tray of crunchy and light, golden-yellow puff pastry egg tarts. You will feel so proud. Just came back from HK. One more day to go before going back to work. 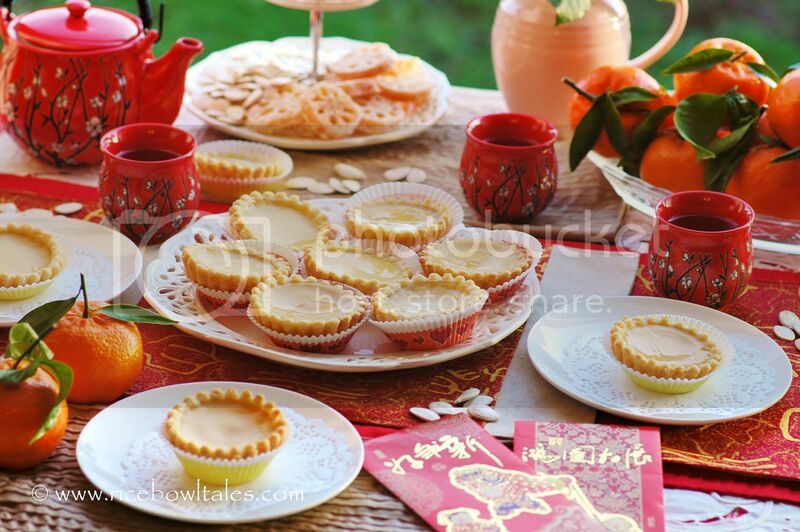 I want to try to make the egg tarts as my kids love egg tart. Just want to clarify.. under note 2: it requires to put into the fridge for 6-7hrs and under note 3c, it requires another 7-8hrs. Why it required such long time. 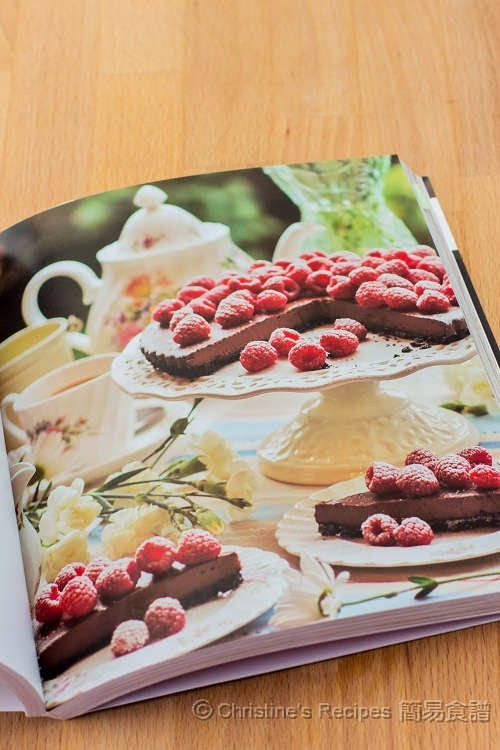 I was reading the Number 1 receipe, you have around 20mins etc. 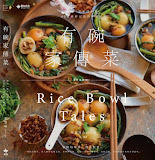 Hi, I know I've already answered your question in the Rice Bowl Tales Facebook message box, as someone else has asked me the similar question recently, thought I would put the answer here too. 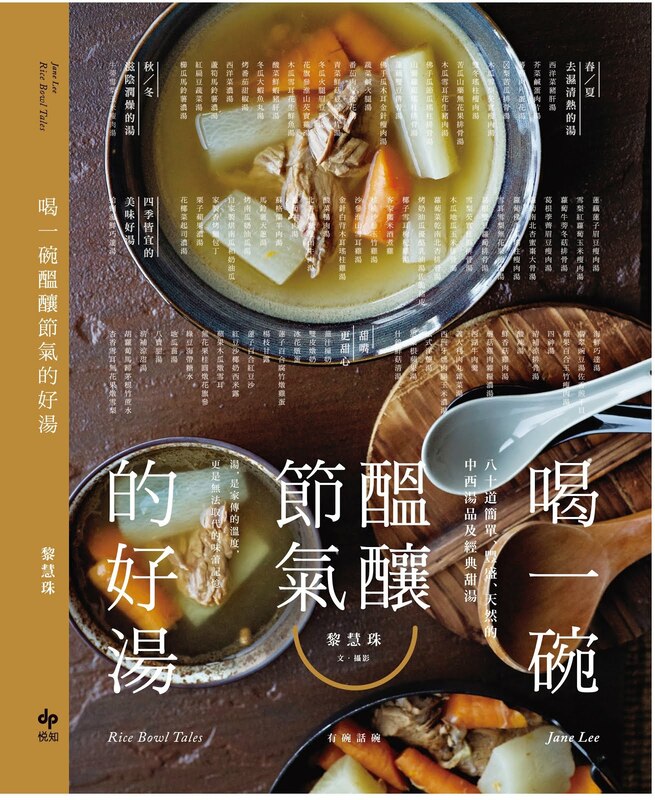 對啊，是普通中筋麵粉 all purpose plain flour. Hi! I tried twice using this recipe, but my oil dough was really really sticky after mixing the oil dough recipe. I used cold butter but when I was done mixing, the butter just melted down and ended up really sticky. I also put it in the fridge overnight, and the next day it was away too hard, left it to soften a bit and when I was trying to roll it, the oil dough just stick all over my rolling pin, and it was so hard to blend in the water dough, i couldn't even flattened it to the first rectangular shape :'( could you give any kind advice on this please? :) very much appreciate it!